The world’s first control system that will allow engineers to programme autonomous satellites and spacecraft to think for themselves has been developed by scientists from the University of Southampton. Professor Sandor Veres and his team of engineers have developed a cognitive software agent control system called ‘sysbrain’. Using natural language programming (NLP), the software agents can read special English language technical documents on control methods. This gives the vehicles advanced guidance, navigation and feedback capabilities to stop them crashing into other objects, agent-based control with mission execution capabilities and the ability to recognise and reconfigure faults. 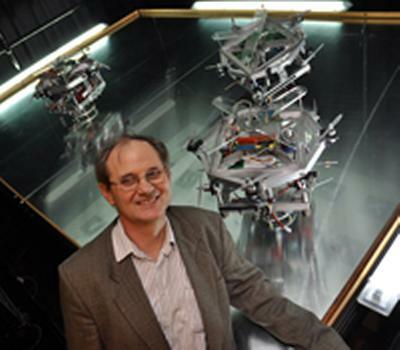 EPSRC-supported collaboration has recently started with Professor Michael Fisher from Liverpool University's Computer Science department to further develop the logic-based reasoning and multi-agent cooperation of these intelligent systems. Watch a video of the ‘Sysbrain’ satellite models and an interview with Professor Veres here. Further information about the University’s autonomous vehicle control systems laboratory is available here.